Thousands of doctors in Peru have agreed to suspend a strike that has left many poor people without medical care for more than a month. The leader of the doctors' union, Cesar Palomino, said they would return to work while they consider government proposals for a pay rise. The doctors had complained that their pay was not increasing despite strong economic growth in Peru. The strike caused huge backlogs in hospitals and clinics. Peruvian media reported that the decision was taken shortly after the government threatened to cut the doctors' pay unless they returned to work. Some 1.5m medical appointments were missed because of the strike, the BBC's Mattia Cabitza reports from the Peruvian capital, Lima. He says it affected mostly low-income Peruvians, who cannot afford private health care. 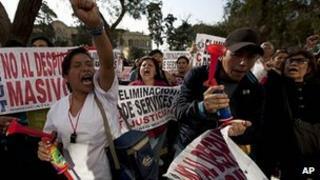 Unions have blamed economic policies pursued under President Ollanta Humala for blocking wage increases. The government - which has also faced a teachers' strike - has said pay must be based on performance. Mr Humala took office in July 2011 vowing to eradicate poverty and social exclusion.